Home Cooking, Capitol View at Madea's Delicious Home Cookin'. The Arkansas Legislature is in session. Lawmakers are coming in from all over the place to make the policies and decisions that will continue to affect us for years to come. Certainly not the sort of thing you want to tackle on an empty stomach. But choices within view of the Capitol grounds are limited. And chances are, it's not going to be easy to get in and get out in a hurry in these sort of places. 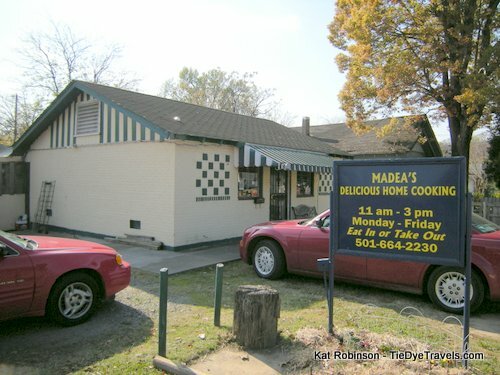 That's what makes Madea’s Delicious Home Cooking so good -- it's good food, it's quick service if you want quick service -- and it's right there just blocks from the state's seat of power. My traveling companion and I ventured there on a Thursday afternoon in November on the recommendation of my best friend and my mother. Can’t go wrong with recommendations like that, can you? Both had been telling me for some time that I needed to check out this little spot off Woodrow that only the locals knew about. It didn’t take long for us to find the eatery, even though we overshot 7th Street the first time up Woodrow (someone’s taken the street signs at that intersection). Doubling back, we found the little restaurant in an unassuming building at the southwest corner of 7th and Appianway -- complete with derelict ancient piano outside. 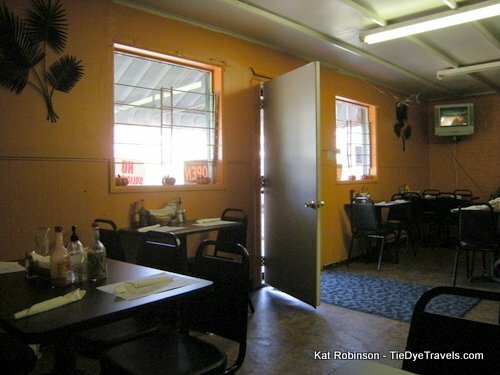 The smallish restaurant seemed humble -- but the cars in the lot did not. A selection of vehicles worth far more than my own were pulled up like noble horses tied to wait outside the establishment. On entering, we were told to sit wherever we want, and this being the first coldish day of the year I found myself drawn to a table right next to an old fashioned gas heater on one side of the room. No sooner had we sat down than a young woman came and asked for our drink orders. 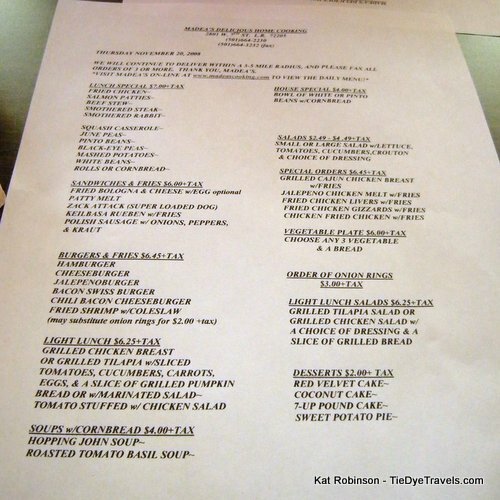 The menus were a surprise -- simple sheets of white paper obviously rendered off someone’s computer printer first thing in the morning. The complexity of the menu surprised me -- with such offerings as fried chicken, smothered pork chops, and something called a Zack Attack. But one item on the menu got my curiosity right from the get-go -- the Smothered Rabbit ($7 with two veggies and bread choice). I went for it. My traveling companion saw a listing for “Light Lunch” and went for that… boy, was he surprised! 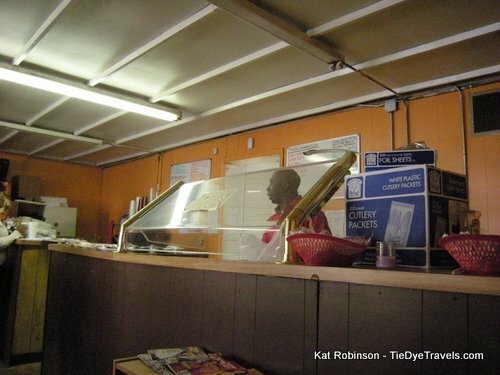 Our food orders were taken by one Madea Jeffrey, the proprietor and soul behind the restaurant. She deftly answered my questions and, when I asked about the food we were about to be served, offered me a cookbook to peruse while we waited. The cookbook, by the way, is on sale for $10.50, and from leafing through it seemed to be chock full of good advice and home-style recipes. We were a little late on our lunch, not arriving until nearly 1 p.m., but the restaurant was still more than half full. At the table next to us, two well dressed men argued about whether it was worthwhile to finish lunch and ache later or to stop where they were. I noticed before they left they did their best to clean their plates. Other customers came and went, and I noticed a young man who diligently appeared and cleaned each table as it became vacant. He also checked on us several times to make sure we had plenty to drink. Didn’t take long for our entrees to arrive. Madea brought out our plates separately -- first my traveling companion’s lunch -- a plate with a grilled piece of tilapia situated among wedges of tomato, egg halves, carrot sticks and cucumber slices, and another plate with a couple of dark pieces of pumpkin bread. He was asked what sort of dressing he’d like for his salad -- and chose Thousand Island. 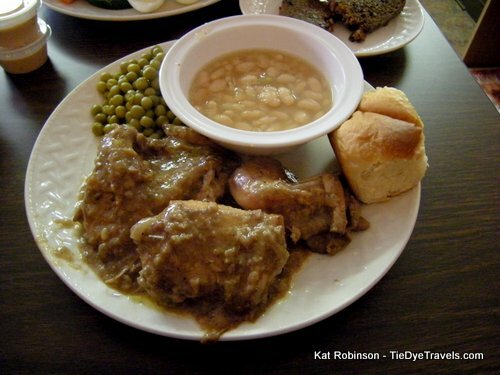 My plate arrived right on its heels -- and surprised me -- three rabbit quarters breaded and drenched in a dark roux gravy on a plate with peas and a bowl of white beans. Honestly, I wasn’t expecting so much food! And this is really where the home cooking shines -- in these simple yet hearty dishes. My rabbit was hot and falling off the bone. Some folks don’t like to tackle rabbit because there are bones everywhere, but it didn’t matter here. The meat flaked off with a generous dose of its gravy and breading, and tasted of care and gentle cooking over hours of time. There was no rush put into making this creation. The white bread roll offered with the rabbit was the perfect sop for the dish. I found the white beans to be on the salty side, but not from the expected ham or bacon. Instead, soft translucent pieces of onion floated in the white bean broth. The peas, which had obviously spent much of their life in a can, were mash soft and reminiscent of dinners at the house when I was a kid. 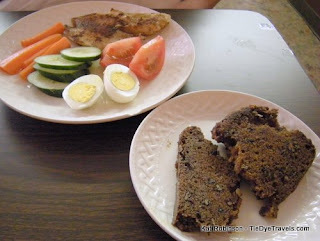 My traveling companion’s tilapia was a buttery surprise, completely soft yet well done, with a good and thorough seasoning that went well without being overdone. The veggies were a nice choice instead of a traditional salad and easier to manage. But it was the pumpkin bread that truly amazed. Instead of the soggy, overly sweet breads many restaurants serve up around the holidays, this firm offering was buttery and slightly salty, a hearty ingredient of its own to add to the mix. I could have lived on that bread alone for the day. The problem with large home cooking portions is that you don’t have much room left for dessert, so we had to pass. Which is a shame, since I really wanted to try out the 7-Up Pound Cake on the board for the day. Other offerings included Red Velvet Cake,. Coconut cake, sweet potato pie, and something on the board named “What You Call It” cake. Desserts are just $2 and are already sitting out on the counter on Styrofoam plates, wrapped in plastic. If I’d been thinking I’d have grabbed one to eat later. I did notice quite a few locals come through and order from the hot bar to take with them. Indeed -- it seemed like about half of the clientele chose to pick up and depart in this manner. That’s all right -- it left more room for us to enjoy our meals and relax a bit. Madea’s is only open for lunch Monday through Friday in the Capitol View neighborhood. Don’t let appearances fool you; I’ve paid four or five times as much for similar dishes at fancier restaurants that didn’t taste half as good. It’s open from 11 a.m. to 3 p.m. Monday through Friday (and Friday is catfish day!) and you can check out the day’s menu at the restaurant's website. Dig That Diner - The Pancake Shop in Hot Springs.